LONDON — Hundreds of thousands of protesters opposed to Britain’s impending exit from the European Union marched through central London on Saturday, demanding a new referendum and to have a say on the government’s final Brexit deal with the EU. 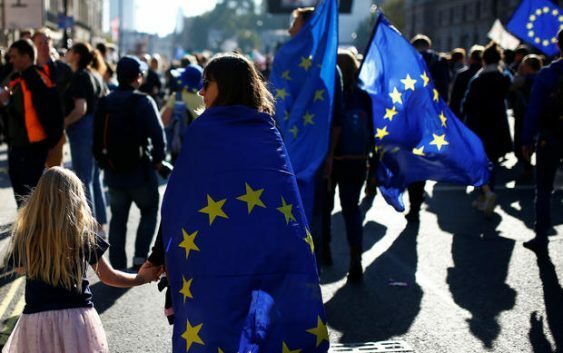 Young voters led the People’s Vote march to London’s Parliament Square, which supporters say attracted approximately 700,000 protesters, BBC News reports. The Metropolitan Police said it was not able to estimate the size of the crowd. About 150 buses of marchers pour into the British capital from all across the country. Police did not provide an attendance estimate. Protesters participating in an anti-Brexit demonstration march through central London, Britain October 20, 2018. The march also had support from a number of MPs who want a fresh vote. May, speaking at an inconclusive EU summit in Brussels this week, said she would consider extending a proposed 21-month post-Brexit transition period for the U.K – one that could keep Britain aligned to EU rules for more than two years after its March departure.